As part of its outreach and education programme, the European Southern Observatory designs, implements and supports exhibitions. Most of these are temporary, but also include several permanent exhibitions in Europe and in Chile. Parts of the funding for some of the exhibitions come from the ESO–Chilean Government Joint Committee, which was created in 1996 as part of the supplementary agreement between ESO and the Republic of Chile to develop astronomy and related sciences in Chile. The Cosmic Evolution exhibition lets visitors follow the trail of cosmic evolution, from the birth of space, time and matter to the present day Universe. This exhibition, inaugurated in 9 December 2009 and set for an initial two-year run, is the result of a cooperation involving five Munich- and Garching-based research institutions, including ESO. The Deutsches Museum is one the world´s most prestigious science and technology museums. The astronomical exhibition, Universe, at the Mirador Interactive Museum (MIM) in Santiago (Chile) contains 2D and 3D luminous interactive elements that simulate the experience of plunging into space for the visitor. 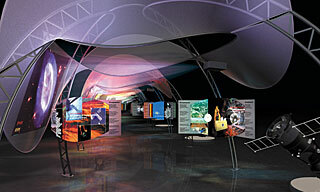 The exhibition, inaugurated on 4 September 2008, was co-funded by ESO through the Joint Committee ESO-Chilean Government. 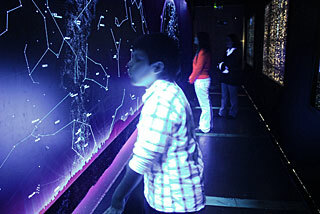 The MIM contains interactive modules on different fields of science and is the most visited museum in the country. 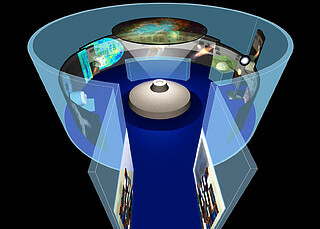 The renovated Astronomy Hall includes different types of telescopes, such as the kinds used by Galileo and Kepler, a scale model of the Solar System, a heliostat to show sunspots, a scale to determine the weight of visitors on different planets and a special corner on archaeoastronomy and the observation of the night sky by Native American cultures. 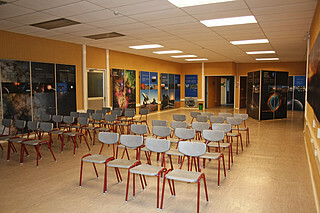 The Astronomy Hall renovation was possible thanks to the financial support of ESO, through the ESO-Chile Joint Committee. The exhibition was inaugurated on 22 October 2009. ESO and ESA/Hubble are participating in the large Science Tunnel travelling exhibit. The exhibition is led by the Max-Planck Society and takes the audience on a fascinating expedition into the mysteries of our world — to groundbreaking discoveries and to the current issues and insights of modern science. The visitors move through twelve stations, from the smallest elements of our world to the largest structures in the Universe. The exhibition has adopted an original approach to "bring the adventure of research at the boundaries of knowledge closer to people in other countries". 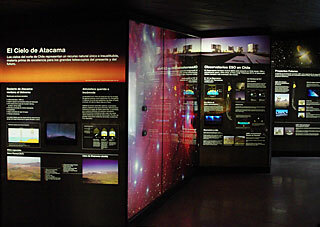 A Window to the Universe is one of the five permanent exhibitions installed at the Museum of the Atacama Desert (MDA), in Antofagasta (Chile's Region II). The MDA is built on a levelled area in front of the Huanchaca Ruins, the remains of a silver foundry from the beginning of the 19th century. 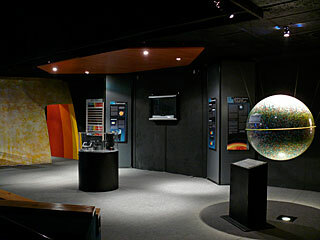 The museum, which contains unique collections, presents the whole history of the Atacama Desert, from its geological formation up to the present day, when it becomes a privileged site for ground-based astronomy. 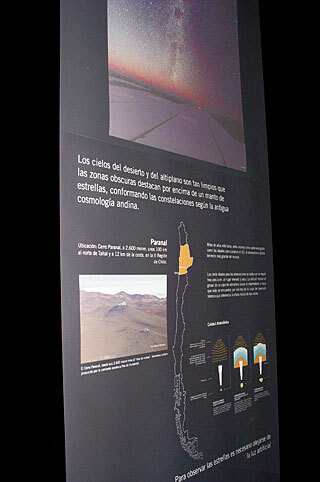 A Window to the Universe was designed and donated by ESO as a contribution to the Region of Antofagasta. 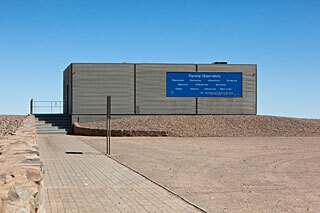 ESO has a permanent Astronomy Hall at the Museum Augusto Capdeville of Taltal (Chile's Region II), the Paranal Observatory's host municipality. The exhibition, inaugurated on 12 September 2007, is part of the fruitful cooperation between ESO and the Municipality of Taltal. This plan of mutual support was established as construction of Paranal Observatory began and aims to develop cultural projects in the benefit of the whole community. Historical and environmental aspects in this unique region are important priorities for ALMA. 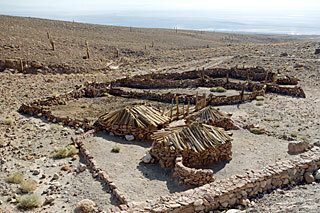 The remains of a small local settlement located 21 kilometres along the access road to Chajnantor have been rebuilt, taking into account the advice of the last owner, and after consulting an archaeologist from San Pedro. The place serves now as a site museum and an interpretive centre for local cultures and history.